I lived for two years by myself in Toronto when I was in my early twenties, and often remember how hard it was to cook for just one. Certainly a change after coming from a family of six. So I sympathize with our seniors in the community and those who are single. Eating for one isn’t easy. I think this microwave cupcake is an awesome idea for a treat. It makes enough for two cupcakes and is ready in no time. In a bowl beat butter with brown sugar until fluffy. Beat in egg yolk, sour cream and vanilla. Then mix together flour, cocoa powder, baking powder and soda and stir into the butter mixture. Your batter is ready. 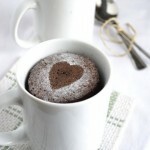 Put a paper muffin liner into two lightly greased microwavable mugs and put half the batter into each liner in the mug. Microwave on medium for about 90 seconds. Then microwave for another minute on high. Use a cake tested to see that its cooked through, by inserting in the middle of the cupcake and it should come out clean. If still sticky microwave for 30 seconds more. Let cool in the mugs for 5-10 minutes and run a knife around the liner to let it pop out. You can top it with store bought chocolate icing, or make the following chocolate topping: In a microwave bowl measure 3 tbsp semisweet chocolate chips and 2 tsp butter and microwave on medium for about 30 seconds until almost melted. Stir until melted, stir in sour cream. Refrigerate for about 10-15 minutes until its thick enough to spread on the cupcakes. Enjoy! !